"Earth's Crammed With Heaven": Withing you a merry crithmuth! Withing you a merry crithmuth! 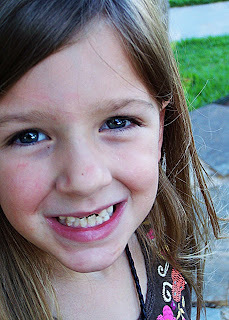 All she wants for Christmas is her two front teeth. ohhhhh ethan will be so jealous! he's waiting on his first tooth to come out. so what's for the big bday gift? Sooo cute, and, I have to say it, SOOOO grown-looking. Who IS that young lady? Anna gets braces Monday--so all she'll want is nothing crunchy, hard, or sticky. Kinda narrows it down. Tell Em happy early b-day, and wish she could be here for Beth's tea party next weekend. Please tell Emma that she is beautiful and although she always has been...she is just getting prettier by the moment! Thanks for passing the message along. Tho thweet! When did the baby get so big?? Awk!